We’re happy to announce that our mortgage calculator plugin for WordPress has been launched and is available today for FREE from the WordPress repository or directly from the Admin->Plugins section of your WordPress website. 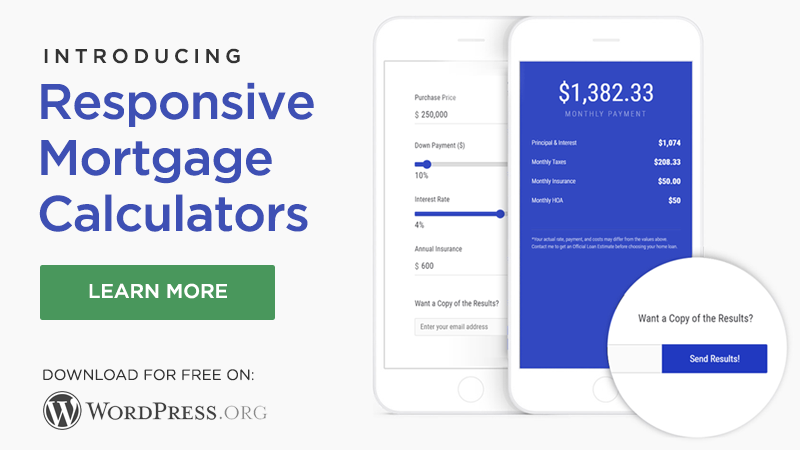 If you’re in the mortgage space you’ve probably seen a hundred different versions of mortgage calculators, all ranging from copy/paste widgets to unresponsive calculators that you can only show on a desktop version of your website. Our goal in building these calculators was to provide a free resource for the everyday loan officer or mortgage team to easily implement into their website, quickly brand the calculators so it looks as though you’ve built them yourselves and make sure it was responsive so no matter the device, your prospects enjoy a seamless experience. Where we go beyond the typical mortgage calculators is providing the ability for you to generate leads. This is done very simply and effectively. Should the user decide to have their results emailed to them, we fire off an automatic email, tailored with a custom message from you along with their desired results and you receive a notification about a new calculation being processed. You can immediately follow up with this lead or have it connected to your crm to be added to your database in general or a specific drip campaign.